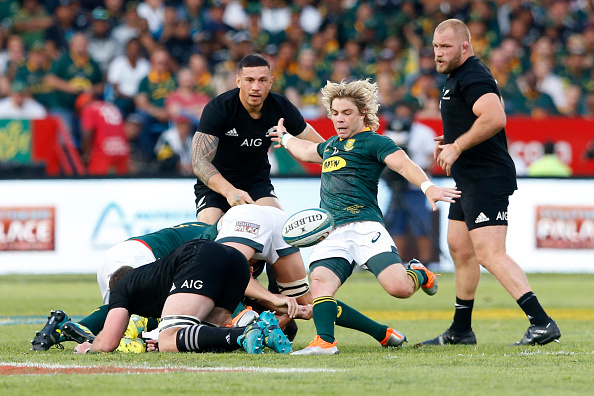 CRAIG LEWIS takes a closer look at the Boks’ astute kicking strategy that left the All Blacks frustrated and frazzled in the first half at Loftus last Saturday. 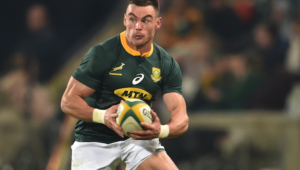 Although the Boks ultimately slipped to a disappointing 32-30 defeat against New Zealand in their final Rugby Championship clash, they produced a tactical masterclass for much of the encounter. In particular, the Springboks enforced a highly effective kicking approach early on that deprived the All Blacks of territory and built pressure by constantly turning the New Zealand defenders around. 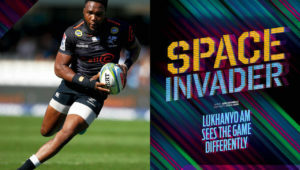 After the encounter, coach Rassie Erasmus suggested it was one of the Bok team’s most impressive tactical performances, while All Blacks counterpart Steve Hansen acknowledged that South Africa’s kicking game had been an extremely ‘smart play’. ‘They turned us around, and didn’t allow us to get into the game, and there were long periods where we didn’t touch the ball, particularly in those first 25 minutes,’ he commented. In a few examples below, we take a look at this approach that saw the All Blacks enjoy just 22% of territory in the opening half. In the first clip, Handré Pollard provides a taste of what’s to come as he sends a flat, diagonal kick into space. The All Blacks clear to touch and the Boks have a net gain of about 20m. The next clip shows an even more effective example. From around the same field position, this time Willie le Roux puts a neat little dink kick over the defence for Aphiwe Dyantyi to chase. Although the ball ultimately beats the wing into touch, Dyantyi gives Le Roux the thumbs up. Below, it’s Faf de Klerk’s turn to begin exerting his influence on this approach. Darting to the blindside, he puts in a little grubber for Dyantyi to chase. Again, it’s not the perfect outcome as Waisake Naholo reads the play, but he’s met firmly in defence. 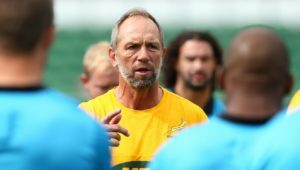 Already what the Boks have done by this point, though, is to start keeping the All Blacks defence honest and mindful of the fact that they cannot just shoot up and leave space in behind them. The next clip shows another impressive piece of play from De Klerk. Take note of how he nods to Dyantyi at the base of the ruck to signal that he’s about to put up a box kick for him to chase. De Klerk’s contestable kick is perfectly weighted despite the fact it’s unfortunately lost forward by Dyantyi. De Klerk is starting to come into his own. The example below demonstrates another lovely read from the scrumhalf as he finds space with a beautiful kick over the top and deep into the All Blacks 22. Within this opening quarter, the All Blacks have hardly had any ball or territory, while being forced to constantly restart play from deep. Their frustration is growing. New Zealand’s desire to start enjoying some ball-in-hand possession is demonstrated below. This time, Damian de Allende puts a kick into the 22. The ball doesn’t find touch, but Ben Smith looks to run from close to his tryline. However, note how both Cheslin Kolbe and Jesse Kriel have superbly chased the kick, with Smith met in defence by these two players as Pieter-Steph du Toit and De Allende himself arrive. All still within the opening half an hour, we look at a final clip below where De Klerk is at it again. From the base of a ruck near the halfway line, he again turns the All Blacks around with a perfectly executed kick into the 22. It’s these clips that aptly illustrate just how the Boks came into Saturday’s clash with a clear tactical plan in place, and took the All Blacks out of their comfort zone.